(if you are following along previous tutorials) otherwise you download complete files setup CLICK HERE. 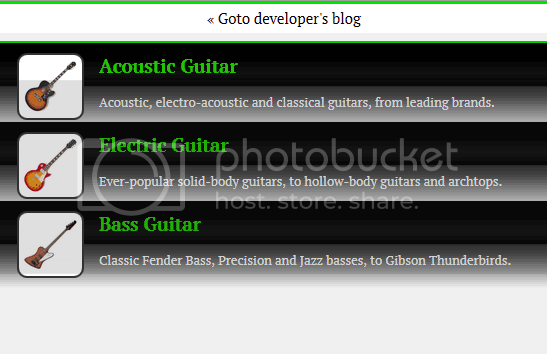 ng-app=”GuitarApp” is name of our App Module i.e Module to be loaded when html starts reading content of AngularJS. style.css is link to style sheet and controllers.js is link to JS file. ng-controller=”GuitarFunction” is name of controller inside our module. ng-repeat=”item in guitarVariable” item is reference to our variable is in controllers.js holding data and ng-repeat directive is like a loop that iterates in guitarVariable till model data is totally read starting from first item to last item in data.json. 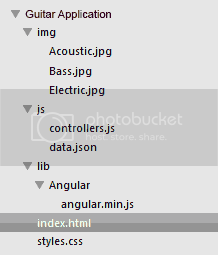 ng-src means do not load images until angularJS loading is done otherwise it may throw error if you use simple src. Download Complete Code So far, we showed JSON data from controllers.js to index.html and used a style sheet for better styling. pretty simple. This is how it should look like when you run it in browser (Try running it in Firefox). Next we shall see how we can get data from a JSON file. keep this file and folder hierarchy setting it will be used for next tutorials.